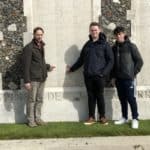 In the spring term two sixth form students, Jake Dunkley and Sam Briggs, accompanied me, and representatives from other schools, to the Belgian and French battlefields. 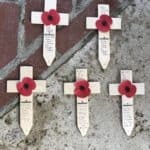 Our objective was to try and visit the memorials or graves of servicemen of Wollaston and Strixton who died during the first world war, or shortly afterwards from their wounds. During the week leading up to the one hundredth anniversary of the Armistice, we were able to share our experiences and some of our research with students in an assembly. We wanted to try to make our commemoration as personal as possible, so chose the theme of “People like us.” We started by showing names, photographs and other personal information about each name and, crucially, where they lived in the village. 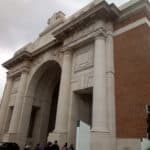 We hoped that some of our audience would recognise those streets and perhaps some students may even live in the streets we mentioned, reminding them that these soldiers and sailors would have seen and walked the streets that we do. In an effort to try and make this more personal, five or six volunteers from each year group read a first person account of where these soldiers were, and what they were doing, shortly before their deaths. Our thanks go to local historians Linda Groom and Gordon Hall for their help with this research and we were pleased to be joined by Gordon for our year eleven assembly. On armistice day, Jake, along with many other students and their families, attended the wreath-laying ceremony at Wollaston’s war memorial. We were pleased to be able to take part and acknowledge the ultimate sacrifice that these soldiers and sailors made.